It appears Kassians thumping of Eager has given him a concussion. Last edited by SKYO on Wed Jan 23, 2013 3:46 pm, edited 1 time in total. If Kassian can bring that game plus click with the twins then what a great pick up he will be. Next time someone wants to use Dank's head as a punching bag it will be nice to have a Zack attack as a follow up. Hockey Widow wrote: If Kassian can bring that game plus click with the twins then what a great pick up he will be. Next time someone wants to use Dank's head as a punching bag it will be nice to have a Zack attack as a follow up. I really hope Kassassin can stay with the twins for all eternity, he needs those minutes to thrive! Time for a Kassian jersey! Wished Kassian was here when that little pos Marchand visited Vancouver. CrzyCanuck wrote: Wished Kassian was here when that little pos Marchand visited Vancouver. I really like the idea of having Kassian on the Sedins line. He provides that extra grit and toughness than Burrows can never deliver. 3 rounds of heads snapping back embarassed the refs enough where it had to be a mortal blow to get the call. Don't you remember that the Bruins can kill people without getting a 2 minutes penalty? That made me burst out laughing. A fearsome big guy with skill? Perfect! The Sedins haven't been that protected in a long time (Bertuzzi). 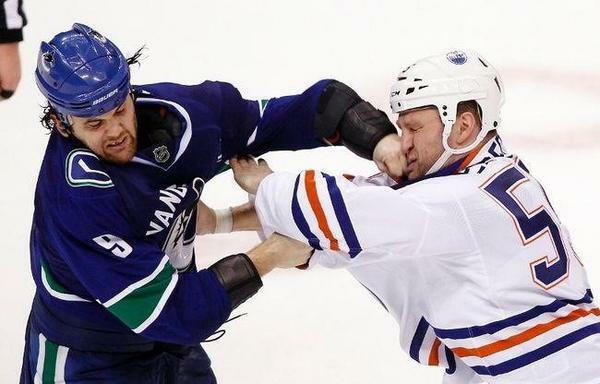 It's real nice to see the calm touch Kassian has with the puck. The kids got talent! I think his confidence is soaring right now and we're just starting to see some of his potential. Uncle dans leg wrote: 3 rounds of heads snapping back embarassed the refs enough where it had to be a mortal blow to get the call. To be fair, it is a chicken and egg situation. If the zebras actually called penalties like they should, there might not be any head snapping or diving to begin with. Mike Gillis says Canucks will incorporate MMA training more and more with specific players. "really like the outcome", says GMMG. Jovocop wrote: Would Daniel be included?? MG trying to turn Kass into Jon Jones. Manny out of the line up against the Ducks tonight. At home as his wife gave birth to their first son. Lappy with a minor groin issue expected to dress. Hockey Widow wrote: Manny out of the line up against the Ducks tonight. At home as his wife gave birth to their first son. Lappy with a minor groin issue expected to dress. Ebbett so sneaky putting holes in condoms now.